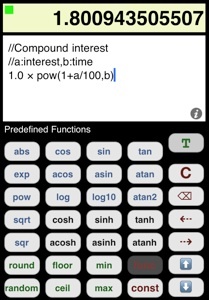 JSCalculator is a calculator app for iPhone and iPod touch which also works on the iPad. 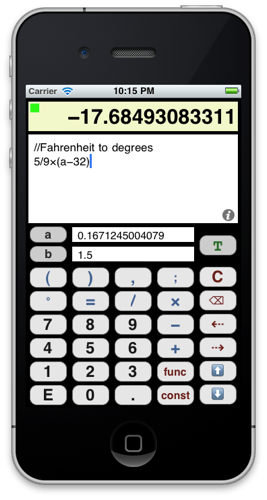 Yes, it doesn’t have a button named “enter” or “=” that has the purpose to execute a calculation and deliver a result. 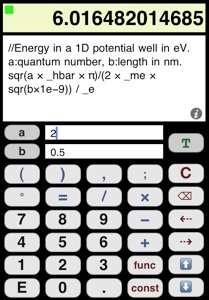 JSCalculator always evaluates whatever you enter. If it can make sense of it, it puts up a green light in its top-left corner and provides a result. If it can’t make sense of it, then there will be an orange or red light there. Just type away and see the result. 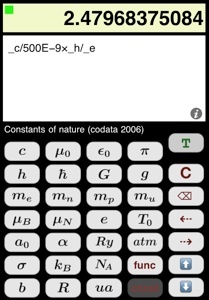 In addition, there are separate keyboards for predefined functions (all those you find in Java Script plus some additional ones) and for the constants of nature. Finally, a big friendly “T” button in the top-right corner let’s you go back to the standard keyboard if you want to enter some special text.